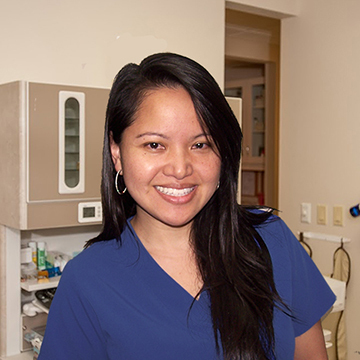 A member of the Synergy Dental team from the beginning, Malee fills a number of roles including director of marketing, registered dental hygienist, patient services, valet, hostess, barkeep, babysitter, you-name-it. Her personality is as big and endearing as her warm smile. Patients have come to love her energy and personal touch, which is good because she plans to be a permanent fixture to Dr. Sudhi’s team. Malee received her Bachelor’s degree in Kinesiology from the University of Texas at Austin and her dental hygiene training at Collin College. She has completed the Dentrix Dental Systems Training Course, has Pharmacy Technician Certifications, and continues to keep up on the latest therapy treatments and technologies in both the dental and pharmaceutical industries. “I feel right at home as soon as I walk through the doors. The atmosphere at our office is pleasant and relaxing. We’re an office that strives for perfection and we do whatever it takes to make everyone that walks through the door feel that they can trust us with their smiles.” When away from Synergy Dental, Malee enjoys spending time with her husband, son, and daughter. She enjoys golfing whenever the rare opportunity arises. She leads an active lifestyle and enjoys fitness.